I visited Thailand in March 2002 and toured some of the main places of interest. First port of call was of course Bangkok. Sites seen were the grand palace, floating markets, thai boxing and dancing, and many temples. A day trip took in the river Kwai before I left Bangkok for my tour through the heart of the country. Stops where made at Lop Buri, where the monkeys live freely in the temple, the ancient capitals of Ayutthaya and Sukhothai and their historial ruins, Phitsanulok and its unqiue buddha, before reaching Chiang Rai. 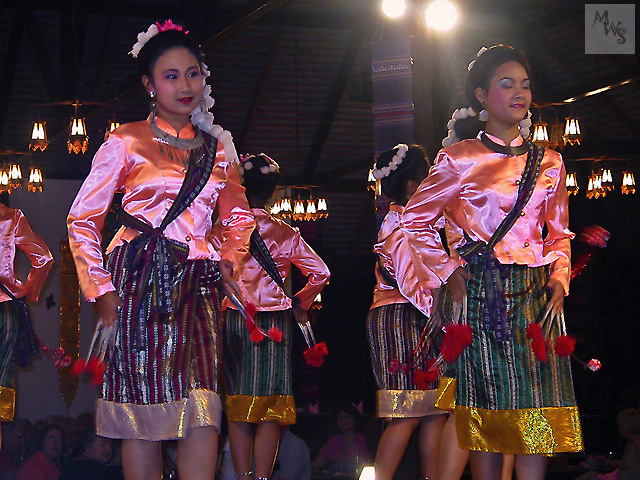 Chiang Rai is near the northern border and home to several ethnic hilltribes. It is also the part of the country called the Golden Triangle where the three countries of Myanmar, Laos and Thailand meet along the Mekong River. My > stop was another ancient capital Chiang Mai, with it famous street market and the nearby working Elephant camps. Lastly I visited the brash beach resort of Pattaya and took in the local drag shows and the white sands of the off shore islands.